How on earth was there a time when I didn’t want fruit in my desserts?! 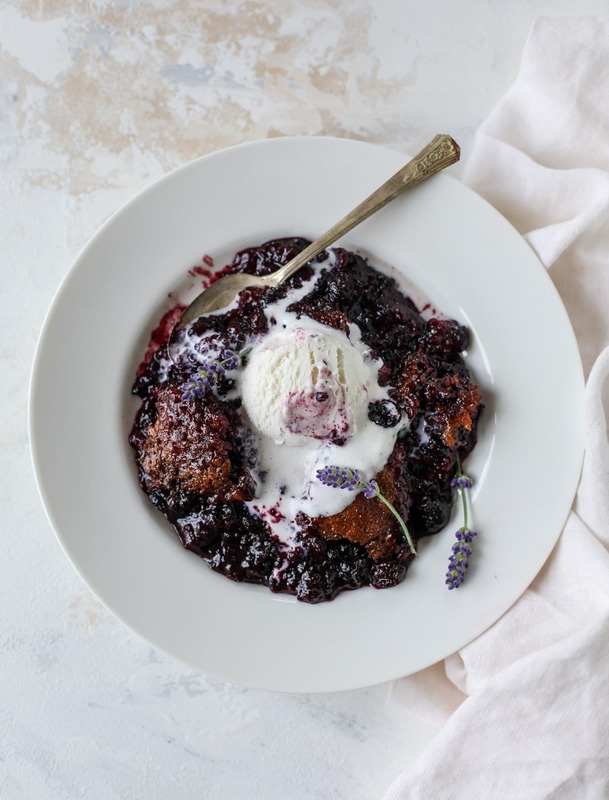 Because black raspberry cobbler is where.it’s.at. All the exclamation points! My obsession with fruit desserts and cobblers continues. Last summer I was nutty about it. Convinced that it was just a pregnancy thing, I thought for sure that I wouldn’t care or be interested in such desserts this summer. I’d be all over the chocolate peanut butter ice cream things and on the s’mores train and what not. But I was oh-so very wrong. Behold the perfect black raspberry! I can only find these for about 32 seconds in my area every summer. A local farm has their own in June and I ran in there last week, bought seven quarts of them like a psychopath and was embarrassed to check out at the counter. I made this cobbler for dinner Sunday night (where it was devoured by all! ), made it again on Monday to share with you and then froze the rest. What to do with the remaining gems? My thing with black raspberries is that the seeds are INTENSE. Lots and lots of little seeds and since the berries are so small, it seems they are in every bite. I know that some people love this but I’m not one of them – so my solution is to take ’em and make them into dessert. 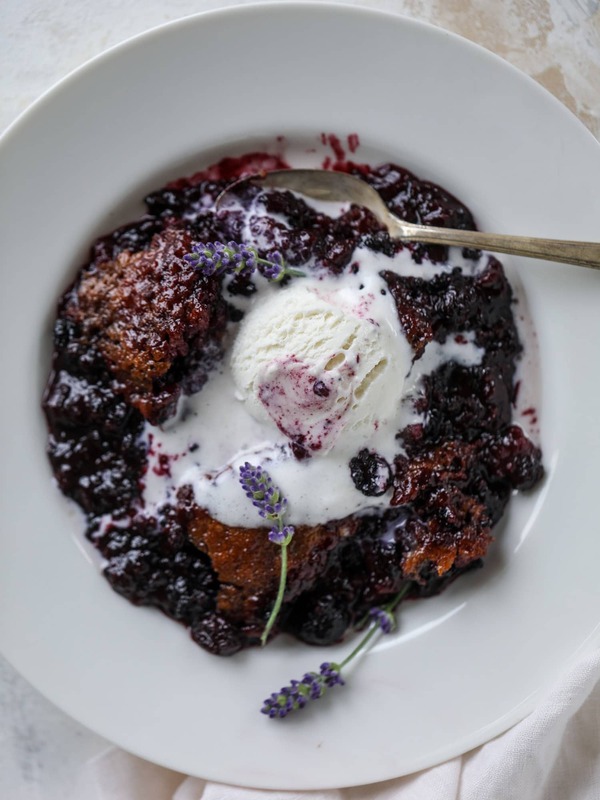 When the berries are warm and bursting and then topped with ice cream? The seeds don’t even come into play. Sure, they still have that bit of crunchy texture (which you would assume that I love being the #texturequeen and all! ), but it’s the flavor that really shines through. OMG and the color. I mean, how stunning is this color? It’s kind of natural lipstick and I’m very into it. And! I’m still having a moment with lavender. Clearly. My lavender plant is going wild right now and it thrills me. For someone who has ZERO interest in floral flavors and scents, I can’t get enough. Also! I’ll let you in on a little secret. While I’ve been infusing syrups and cream and desserts for a few years with culinary lavender flowers, and I love doing that… for this? I used an organic lavender extract and I found it added the PERFECT amount of lavender. Sometimes when you infuse your own, the floral flavor is super overpowering. While I’ll always use the flowers for cocktails and drinks and coffee and things like that, using the extract here made it ridiculously easy and also took the guess work out of it. Love! Oh and p.s. I find mine on amazon! Easy. The flavor here is rich and fruity from the berries. But the lavender adds this floral hint that makes you wonder just what the heck it is, because it tastes fantastic. And I’ve always said that when lavender is mixed with sugar, it takes on an ice cream shop flavor and scent. That’s exactly what happens. It’s SO good. Makes me think I couldn’t even make this cobbler without the lavender. The cobbler itself? 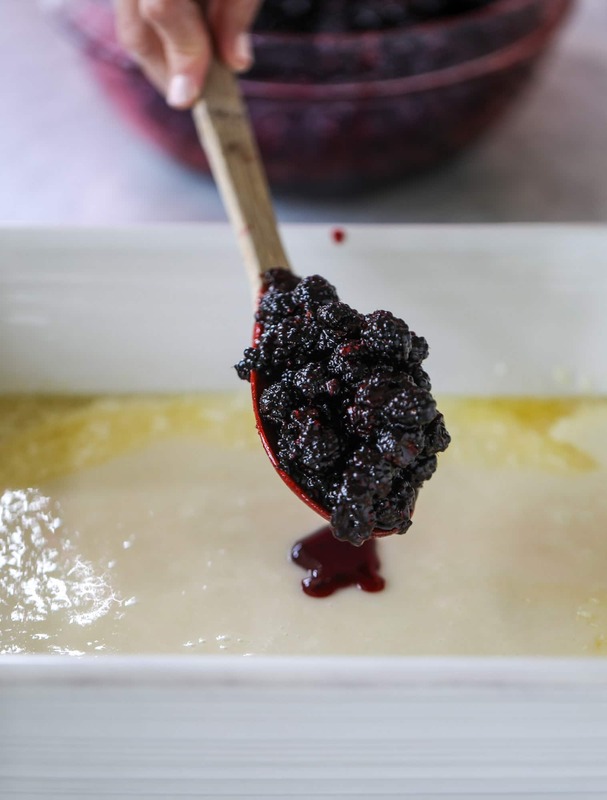 It’s a batter poured on butter and topped with the berries. It’s based on paula deen’s peach cobbler and while this doesn’t produce the “pretty” biscuits-on-top-of-cobbler masterpiece, the taste more than makes up for it. It is SO so good. And who doesn’t want to eat hot purple dessert. 1 cup milk any kind works! Preheat the oven to 375 degrees F. Place the butter in a 9x13 inch baking dish. Once the oven is at temperature, place the dish in the oven until the butter melts, about 5 minutes or so. You want it melted! 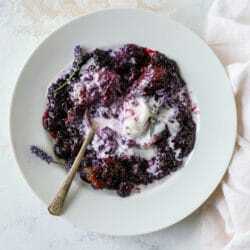 Place the berries in a large bowl and sprinkle on the 1/2 cup sugar. Toss gently. Add the lemon juice and toss gently again, trying not to break the berries. Set it aside for a moment while you make the batter. Whisk together the flour, sugar, baking powder and salt. In a measuring cup, whisk together the milk and extracts. Pour the milk into the dry ingredients and whisk until smooth. Pour the batter mixture on top of the melted butter. Don't mix it! Just pour it on top and spread it to the edges if necessary. Gently toss the berries once more. Spoon them over the batter in the dish (again, not mixing, but just placing them on! ), covering all the batter. Bake for 40 to 45 minutes, until the mixture is golden brown and not very jiggly in the center. Let cool slightly before serving with vanilla ice cream! This melty bowl should be framed. Beautiful bowl of sweet gems, indeed. thanks rachael!! i think there is an ornamental version that you don’t want to use, but most greenhouses sell regular old lavender (or seeds, I’m sure) and I just use that! I make sure it’s not treated with pesticides I wouldn’t want to consume when I buy it, then I just use organic plant food while growing!! “Natural lipstick” lol — loved that. I am also not a big fruit dessert lover — dang, I feel embarrassed saying it. Glad there’s hope to reform — can’t wait to try this! This looks so good. I just ordered the lavender extract. Now, hoping I find the black raspberries. This flavor combination sounds so good! I love making cobbler at home! Looks so delicious and perfect with ice cream! Thank you thank you thank you baking with black raspberries! 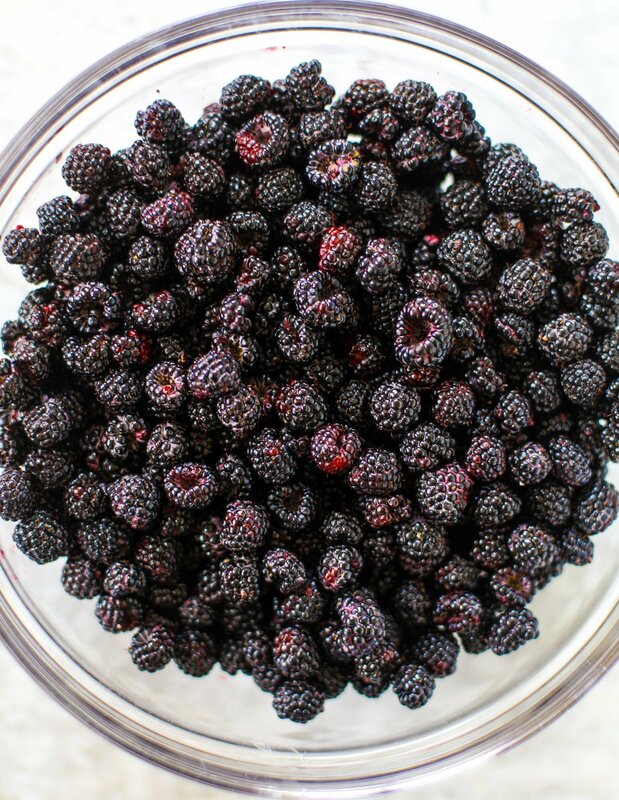 Lots of people think blackberries and black raspberries are the same thing. I own a black raspberry u-pick farm and they are SO much better!!! I can’t wait to try this and share this recipe with all my customers. I’m always looking for easy recipes to share. ahhh you own one? that’s amazing! i know, when i post about them, i usually get a few comments of people saying “these are just blackberries” and i’m like NOOOOO they aren’t! hahaha. I can’t find lavender extract in the stores and I want to make this today!!! Can I substitute food grade dried lavender for the extract and if so how much would you recommend? you totally can!! i think instead of the batter, i’d do 1/4 teaspoon dried lavender in with the berry mixture! Love, love lavender in baked goods! I’ve never tried it with berries before, but that combo sounds great! I’m hoping to stock up on all things lavender at the Lavender Festival in Cresco, PA this weekend! If I cannot find black raspberries can a substitute red raspberries or a mix of them with blueberries? Thanks for posting this. I pick a lot of black raspberries in Iowa — they seem to grow best along the dirt roads that were never upgraded to gravel or pavement. They are definitely different from blackberries. And, I’d say this was one of the best years — I’ve seen in 30 years — for wild black raspberries.